Jessica picked ‘Something’s Got a Hold On Me‘ by Etta James, inspired by our recent viewing of ‘Burlesque‘. Rosie chose ‘The Boy With The Arab Strap‘ by Belle and Sebastian. It is clean. Sit Down and Shut the Folk Up this week is ‘Limbo‘ by Ruth Notman (yes, this is a MySpace link, how 2005.) That’s a link to buy her album, which as a whole is very good as well. We saw her at Folk by the Oak. Jessica read this book about Blithe Spirit, ‘Chewing the Scenery‘. On Rosie’s trip to York, she went round Clifford’s Tower and really enjoyed the train ride. Jessica’s Top 5s run ‘in no particular order’ Abby Sciuto (NCIS), Constable Benton Fraser (Due South), Ned (Pushing Daisies), John Cage (Ally McBeal) and Jess Day (New Girl) who apparently doesn’t qualify for her own Wikipedia page. Rosie picked C.J. Cregg (The West Wing), Spike (Buffy the Vampire Slayer), Joan Holloway (Mad Men), Jack Donaghy (30 Rock) and Malcolm Tucker (The Thick of It). Honorable Mentions: Weasel, The Doctor, Geoffrey, Petula Gordino, Lucille and Lucille and Dharma. Jessica baked some banana and walnut vegan muffins for Father’s Day – you can see them on Instagram. 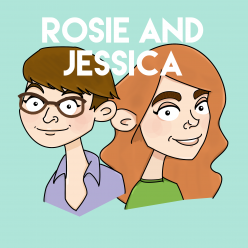 Jessica suggests you watch ‘Pen Behind the Ear‘ with Tim Vine (invite him round) and Rosie offers Historical Justice Squad by her lovely friend Sion. Historical figures fight historical crime!